Today I'd like to run through some examples of my stock purchases. I've already blogged about these so nothing new on that front, but this will give you an idea how I go about buying stocks over the long term and why I buy when I do. Let me try to tell you how I buy and why I buy. What I do with winners and losers. I have 3 winners and 3 losers to run through. Yay charts! Please click on each stock link and read my old posts for more info. The percentages shown in these pictures are percent of the total shares I've purchased of that stock. Let's start with something ugly. SOFT. Down 79% from when I first posted about it and honestly I don't think the company exists anymore. Down 89% from my highest purchase point. Ouch. Still I hold my shares and actually there's been some good volume lately which makes me think maybe there's a chance... We will see. I continue to hold out hope that something will happen some day. I am not buying or selling from this point on unless there's a spike to sell into or some news. Maybe I'd buy if it drops to a nickel. My base strategy is to buy stocks with potential that are priced as if they are dying and bet that more will live than die. Part of that strategy is some will die and we may have found one here in SOFT. Here's the chart of all my buying up to the present day. I bought 6 times over almost 9 months before deciding I had enough stock to write about. The stock had dropped which made it a more interesting story to write up. I made my initial purchase after a big spike that came from a 10Q. I bought as it dropped then bought some more a few weeks later. I then waited for 6 months. Not for any reason, just waiting and watching. I was kicked in the pants to buy more when they announced the sale of a product line in Aug 2016. I love a company undergoing change and SOFT was doing exactly that, moving from old legacy business to what they thought was exciting new business with potential. I bought a couple more times at that level then one final buy at the dollar level before it fell to the 0.20 range it's been in for the past year. As detailed in my most recent SOFT post, they have not been putting out good signs. Let's move to a happier stock, PEYE! This one was flat in the $0.50 - 0.60 range for years until July 2018 when they announced their best quarter in 20 years. You can read my old blog post for the thesis. So far it has worked out. Basically the company has turned the corner on a number of programs from engineering R&D into production type work. If all goes well it will keep going. I don't know if I'll buy more stock or not, depends what happens. If it were to drop down below a buck again I might buy. I made my first purchase after they announced some warrants priced as if they expected a big jump in revenue and earnings. Or should I said that's when I tried to make my first purchase. It took months to get any shares at all and many of the buys you see here are just when I could actually get shares. I had an open Good-Till-Cancelled buy order sitting for quite a while. The company gives quarterly conference calls that always sounded so good. For years this stock sounded good but it was delay after delay in getting to the promised land of production orders that kept the price low. Anyhow sometimes after the quarterlies I would decide it sounded too good and raise my buy price to take what I could get. I was a pretty steady buyer for probably about a year on this one before I got enough size to write up a post. Now back to the ugly. Actually with GIGA I think it's the ugly that has potential to be beautiful. I continue to be a buyer on GIGA even though it is down 78% from my blog post and 83% from my highest purchase. It just keeps sounding so good and I am hopeful we have finally found a bottom. GIGA is one of those stocks that has made huge spikes on press releases over the years. I bet it happens again. I bought on the backside of one of those spikes in Dec 2015. They had made some announcement and the stock shot to the moon. I didn't own shares so I just watched it drop and bought when it hung up at about 50% drop. I bought a few more times as it kept dropping back to where it was before the press release. After a few months there I decided to write my blog post and then I sat. The funniest thing about this chart is those percentages going up because the transaction cost in dollars is not changing! This is my most exciting stock at the moment and the one I've been most heavily buying over the past few months. I originally bought HYDI because they put out a press release announcing a very interesting sounding patent. It took me about 5 months to get the shares I wanted. Part of that was due to myself having funds to buy and part was due to how illiquid the stock was. From the start this one has excited me because of the chart. It was at a very long term low and just sitting there all flat and dead. Yet I thought behind the scenes was an exciting company. A day of really high volume followed my blog post but the price didn't move much. Over the next few months there were a few spikes of price doubling up to around $1 but then it settled back around 0.50 - 0.60. I bought more once it setting down. 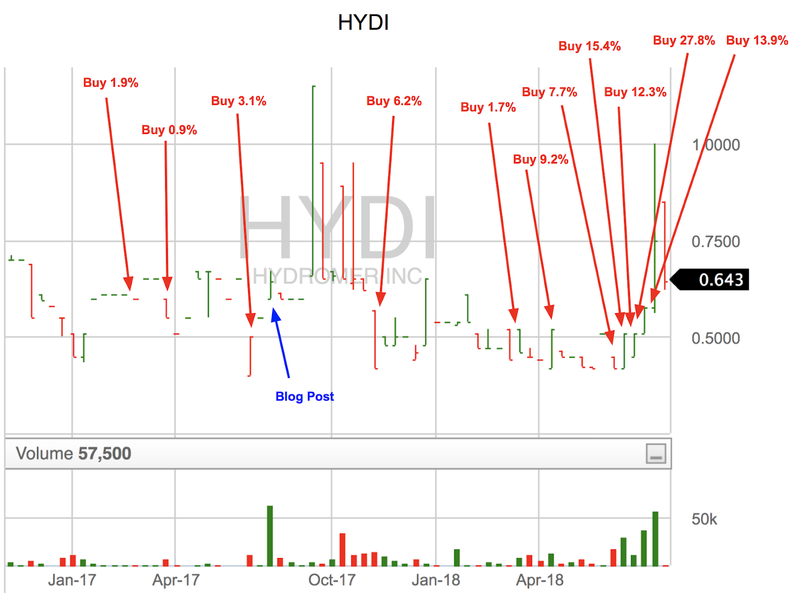 The interesting stuff in HYDI started happening only a few months after I posted when they missed their annual report. I contacted the CFO and he assured me the financials were coming. They missed another report then another. Periodically I would contact the CFO and he'd give me the same message about something holding up their audit but don't worry because numbers and reports are on their way. Yet there was no communication. As of now HYDI hasn't put out financials since Feb 2017 giving us a year and 8 months of darkness. Not ideal. Along the way I bought a couple more times because this stock was flat and boring and here I have the CFO telling me reports are coming back. My basic feeling on HYDI has been they have some good things going on and do not deserve to be priced at their lowest point of the past few decades. I think as long as they survive they will be priced materially higher some day. We got our first glimpse of hope in July 2018 when they announced a new patent which was their first press release in a year and a half. I bought more. In Aug 2018 they announced the sale of a business line. You know I love change and especially a company reinventing itself. I bought more. In Sept 2018 they announced a new CEO taking over. It's the son of the old CEO and he sounds very impressive. The dad owns something like a third of the common. I bought more. Then in Sept 2018 they announced a $0.25 per share dividend. This from a stock that had been trading at 0.50 for almost a year. The stock shot up to $1 and is now around $0.80 even though new buyers cannot get the dividend anymore. Still we haven't seen financials. This one is exactly what I look for. Change. Here we have a dark stock that did not drop. That is one of the interesting things to me, when they stopped talking it didn't move much. They are developing new products. The CFO is telling me filings will come back. They are selling off an old business line and have a new, highly vested, CEO taking over. They must have some exciting plans for the cash from the business line sale and apparently a dividend was in those plans. I am very eager to see financials and I remain hopeful they will come. The risk would be they don't file financials and disappear. I think the darkness is due to all this change. Perhaps they stopped filing because they were lining up the T-HEXX business line sale. Perhaps the old CEO had health issues or the new CEO was in the middle of changing things up. I'm excited to see what the future holds. Now to our final depressing stock of the day. DCAR. What an amazing fall. Adjusted for splits this has come down from $2500 to $0.50 in eight years. It's down 91% from when I blogged about it and 93% from my highest purchase. Disgusting and still I hold my shares. I'm just waiting to see what happens. I haven't bought in a long time though I think about it fairly often. I really need to take a look at it again because it has just gone so low. Certainly seems to be priced as if people think DropCar will go under. I don't remember anything specific that kicked me into buying this one. You'll see my reasoning in my old post. Basically a small company undergoing change and trying to survive. I bought a couple times to get my position then once more when it was sharply dropping to support, then I sat. I bought one more time just because I had money become available and it still looked interesting. I see two things from this chart. One is I missed a good selling opportunity in Oct 2017. Two is WPCS was better off without DropCar. Let's see what happens. And now to my favorite chart of all time, HEMA. It has been a once in a lifetime stock that I got really right. I first bought in July 2015 around $0.30. The company was dark and out of date in their filings, behind by over a year. They had de-registered from the SEC years before and stopped communicating. The stock had dropped from $3 to nothing. But there was action behind the scenes. They sold off all their old business lines and moved into something promising. The new business was taking hold and they were in the middle of selling their last legacy business line. Sound familiar? This is what tiny companies do. 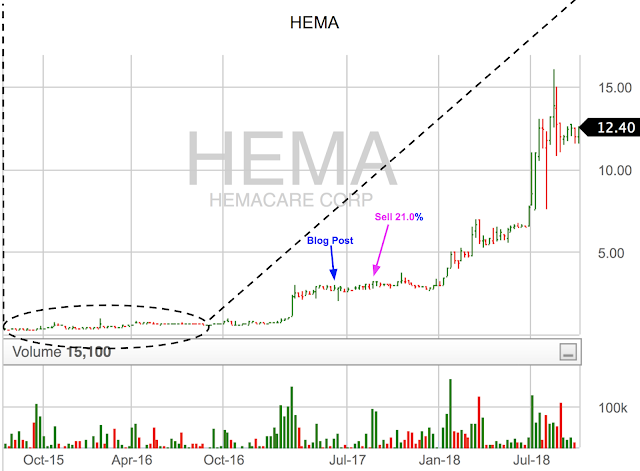 This reasoning is why I bought HEMA and why I have recently been buying HYDI. It's why I bought GIGA, SOFT, and WPCS/DCAR too. Let this be a lesson that sometimes my methods work and sometimes they don't. I think the winners will make up for the losers but I don't know what'll happen. After a few buys I had my position so I wrote up a blog post. To my surprise it dropped so I bought more. A stock newsletter wrote up HEMA and it rose then fell back down. I bought 11 times over about 8 months as the company followed through on their promises. In my original post I detailed a couple reasons for investing: one was continued growth in their new division and two was continued communication. In Aug 2015 they put out financials and in the fall put out many press releases. They announced worldwide shipping. They announced partnerships. It all sounded great and the main thing was they were communicating. I kept buying. That year every time I had money to invest I would compare whatever new idea I had to HEMA and HEMA kept winning. Each new press release gave them more credibility and me more belief in them following through. I eventually stopped buying because it became 30% of my portfolio. It was not my intention to build a position that large. As you can see I've sold HEMA a couple of times. The first one, in 2016, was due to an old strategy. 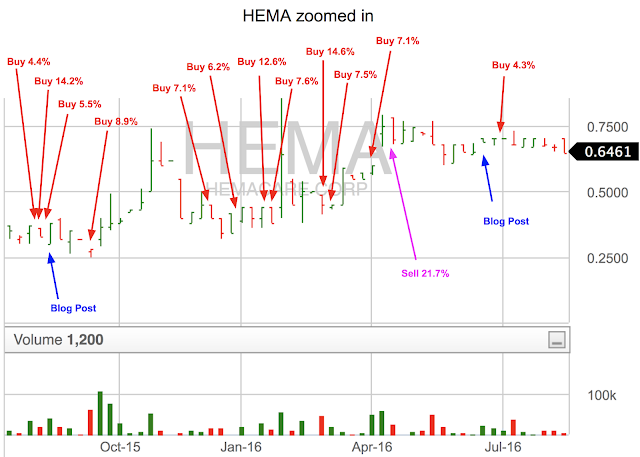 I had an account where I was trying to capture short term gains so I bought some HEMA early 2016 around $0.45 and sold at $0.70. I don't do this anymore. This is the account I used to do odd-lots in. I sold again in the fall of 2017 as HEMA grew to be 60% of my portfolio and I just couldn't take it anymore. I now sit with HEMA somewhere around 50% of my portfolio. As it has climbed up to $12 I am waiting and watching. Just unbelievable. Sometimes the dead can come back to life. As you can see I do a lot more buying than selling. I plan to hold these stocks for years and the dead ones will probably rot in my portfolio forever. I rarely sell and usually it's only because the market has spiked up so high I have to. I tend to buy when there is some change or indication that pushes me and then I wait. As time moves on I buy when the opportunity presents itself either when the chart says or news comes out. I was on the PEYE earnings call last week. Management said that they expect this quarter's revenue to be the same to slightly better than last quarter. They also said that they have significant spare capacity in their facilities to take on new work, so I would expect that any increases in revenue would be very expansive to operating margins. Based on questions from the only investor on the call who had any, management gave an overview of their three main customers, which was very useful to understanding the variety of end markets in medical equipment they address. The one concern the caller raised had to do with dilution over the past decade, both for C-level management and to retain engineering talent, so that's one think I'll be monitoring. Hi just a quick question about your buying, I assume you're just using limit until canceled orders, but how do you determine the price where you set your limit order and the amount that you want to buy? And thanks for the great post! I always use limit orders. Usually good till cancelled (GTC) but not always. The amount I want to buy depends on many things. Ideally I would have an equal weighting of all stocks but it does not work out that way. It depends how much stock is available to buy because these stocks are illiquid and often I cannot get as much as I want. Also depends how much cash I have available and I'm always near fully invested so I get limited here too. And of course it depends how exciting I think the opportunity is. What level to set my price is not a quick question. Depends what I think it's worth and what is being offered. Often times I take what is offered if I think it's a situation I want to buy into. I base a lot of it on the chart. Look at where it has been trading recently and try to imagine what the buying will look like over the next month while you wait to get filled. If a stock has been selling between 0.50-0.60 for the past 6 months, and I feel like I can wait to get filled, then I might put an order for 0.52. But if it's offered at 0.60 and I think eventually the stock will get to $3 or something then I don't worry about paying a bit more and I buy at 0.60. Interesting blog and post, thanks for sharing. On HEMA, can you elaborate a bit on the portfolio weighting side? From the chart it looked like your buying was under $1, and you say you got to 30% portfolio weight, and have only sold 20% when it was at 60% weight. Wouldn't this leave you at an even higher weight, unless your portfolio has grown dramatically elsewhere? E.g. 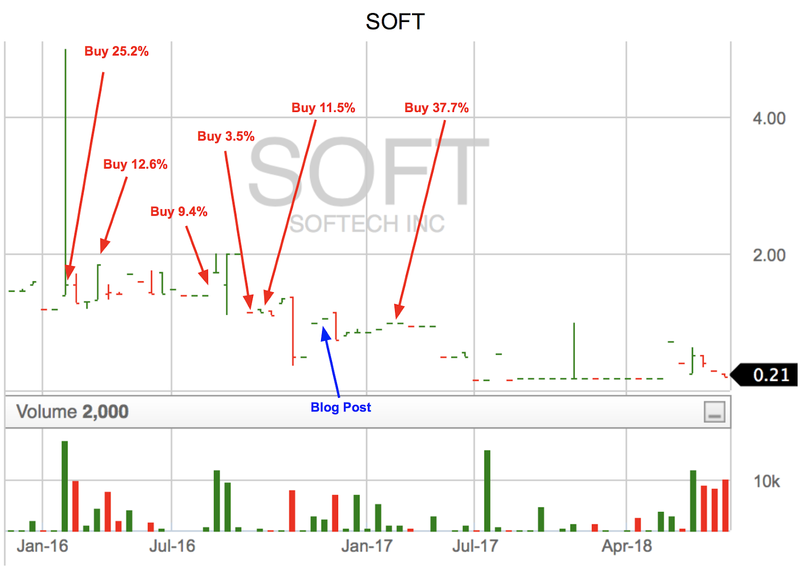 if post sale you end up at 48% (60% position sell 20%, brings to 48% say), it looks likes it's now roughly tripled ... but you say it's still a 50% position. Yes the rest of my portfolio has grown. Also I sold a house in my move earlier this year. With that I had to pay back a 401k loan and we made some profit which I put into my brokerage account. So the rest of my portfolio has been gaining in stocks and I have contributed some more to my accounts. Do you think that your portfolio is influenced by general market performance (of U.S. stock indices) or not? The issue is that the fundamentals of the general U.S. stock market do not look great and I guess that the market will perform poorly in the next years. Almost every global market is cheaper than U.S.